The mission of Trinity Free Clinic is to provide quality free medical health, and dental support to the uninsured, underinsured, and low income residents of Hamilton County with dignity, through a professional and dedicated volunteer staff. “Compassionately” is the best word to describe how the Trinity Free Clinic provides free medical and dental care to residents of Hamilton County who have no other access to healthcare. Lining either side of West 146th Street in Hamilton County are miles of beautiful well-maintained homes, and it’s hard to imagine that the wealthiest county in Indiana also has 21% of residents below the State’s Household Survival Budget. For these people, health care seems like a luxury that is often miles out of reach. Where could a father go who has been suffering with an excruciating toothache? 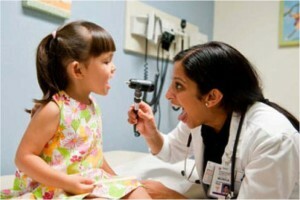 Where could a young under-insured family take their sick child? Since 2000, the Trinity Free Clinic has provided quality free medical, health and dental support to the uninsured, underinsured, and low-income residents of Hamilton County with compassion, dignity, through a highly professional and dedicated volunteer staff. They treat the working poor of the county such as the restaurant workers, house cleaners, landscapers, and many other hourly laborers who find it difficult to find access to affordable healthcare. One of the nearly 400 volunteer professionals could see a myriad of conditions at any Saturday morning acute clinic – a man with thyroid cancer, a child with an ear infection, a mother with two broken molars. Sometimes the needs are small, like a child with strep throat, and sometimes the needs are great, such as the man with congestive heart failure and another with melanoma. In fact, the conditions are as varied as the 81 countries the patients represent. The rest of the week the clinic serves patients by appointment as specialty clinics such as dental, eye, women’s health, podiatry, immunizations, pediatrics, hypertension, physical therapy, or asthma. All patients receive free lab work as well as medications for their conditions. 38% of patients were served in the Dental Clinic in 2015. 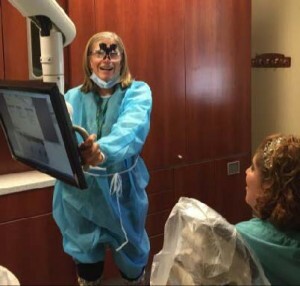 Partnering and sharing the Trinity Free Clinic’s dental space with the IU school of dentistry has allowed additional days for dental patients to be seen. Dental students benefit by having another clinic site in their program allowing them more supervised clinical time. This partnership is a programmatic example of nonprofits and education giving back to the community in a targeted manner. For the working poor dental care is often set aside because the cost is insurmountable. 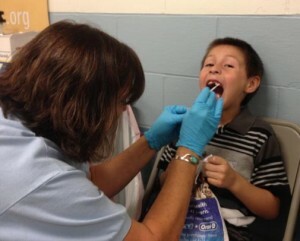 This partnership makes dental care available to all in need. Ferschmin tells the story of a young couple that came in one Saturday trying to find the neighboring food pantry. Knowing the pantry was closed Ferschmin invited them into her office and began searching for another open food pantry. Curiously they asked her what Trinity Free Clinic was. They were amazed by her passionate description of the free services and the father inquired if he could see a dentist for his tooth pain. He had been to a dentist previously but hearing it would cost $1,000 to fix, he walked away. When Ferschmin replied that he certainly could be treated at the clinic at no cost, the young couple couldn’t hold back the tears. “We feel extremely blessed because other medical and dental facilities are very kind to us in taking our patients with serious medical needs” stated Ferschmin. Current research has shown that there is a growing need for mental health care in Hamilton County. The Clinic has stretched the normal 15 minutes intake to 30 minutes giving the patient more time to talk and the physician added time to properly assess. To provide for clients with middle and moderate depression Trinity Free Clinic has added life coaches that meet with patients and incorporate needed life-style changes. Having the flexibility to bend and implement programs as needed allows the Clinic to respectfully treat their patients with dignity, no matter what circumstances or situations they’re facing.